This Bookreporter.com Special Newsletter spotlights a book releasing in the next few months that we would like to get on your radar now. 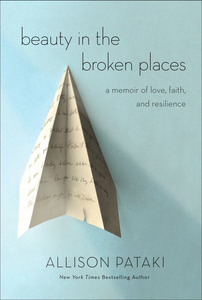 Read more about it, and enter our Winter Reading Contest by Friday, February 23rd at 11:59am ET for a chance to win one of five copies of BEAUTY IN THE BROKEN PLACES: A Memoir of Love, Faith, and Resilience by Allison Pataki, which will be available on May 1st. Please note that each contest is only open for 24 hours, so you will need to act quickly! A deeply moving memoir about two lives that were changed in the blink of an eye, and the love that helped them rewrite their future. Five months pregnant, on a flight to their “babymoon,” Allison Pataki turned to her husband when he asked if his eye looked strange, and watched him suddenly lose consciousness. After an emergency landing, she discovered that Dave --- a healthy 30-year-old athlete and surgical resident --- had suffered a rare and life-threatening stroke. Next thing Allison knew, she was sitting alone in the ER in Fargo, North Dakota, waiting to hear if her husband would survive the night. When Dave woke up, he could not carry memories from hour to hour, much less from one day to the next. Allison lost the Dave she knew and loved when he lost consciousness on the plane. Within a few months, she found herself caring for both a newborn and a sick husband, struggling with the fear of what was to come. This is a manifesto for living, an ultimately uplifting story about the transformative power of faith and resilience. It’s a tale of a husband’s turbulent road to recovery, the shifting nature of marriage, and the struggle of loving through pain and finding joy in the broken places. - Click here to visit Allison Pataki's website. - Connect with Allison Pataki on Facebook and Twitter. This is a special newsletter for our Winter Reading Contests, which will mail on select days through February 22nd. This newsletter is separate from our weekly Bookreporter.com newsletter, which mails every Friday. You can subscribe to that newsletter here.